A natural wood fence adds oodles of curb appeal to any home, but the homeowner will have to work to keep the fence looking good. Every wood fence requires sanding and staining or painting at one point during its lifetime to protect it from the effects of sun, wind, rain, and snow. Besides its protective function, staining give you the opportunity to make your wood fence even more distinctive, as there are many stain colors to choose from. 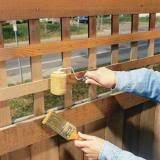 Staining a wood fence is more popular than painting since the staining highlights the wood's natural color, grain and texture. 1. Check the weather before you start your project to make sure that there is no rain in the forecast for at least 48 hours. Wood stain goes on and dries best in clear, mild weather. 3. Cover the area around the fence (including any plants or shrubs) with tarps or drop cloths, or even plywood. 4. Inspect the fence for any weak or rotten boards and repair wherever needed. 5. Power wash the fence with a pressure washer or a hose with a power nozzle. Keep a scrub brush and a solution of water and soap handy. 6. Weathered wood should be bleached prior to staining to kill any mold or mildew growth. Mix equal amounts of bleach and water and then scrub the fence. 7. After the fence is completely dry, apply a waterproof sealant. 8. Wear protective gear. Especially if you will be using a spray gun, you will need to wear a mask, protective goggles and even gloves. 9. Scrape and sand the wood surface as necessary. 10. Test your stain color in a small area in the corner. If you like it, make sure you read the manufacturer's directions on the can for any specific instructions before you proceed. 11. Apply the stain in the direction of the grain, using short and even strokes; you may need to apply up to three coats. 12. The final step is to apply another sealant to protect the color.